EDM refers to Electrical Discharge Machining. It is a controlled process of metal removal. This is done with the help of electric spark erosion. In the EDM process, electric spark acts as a cutting tool, and helps erode material from the work piece. Thus, a finished part of required shape can be formed with this process. This process helps achieve high level of accuracy, and is an effective solution for challenging machining applications. There are different types of EDM processes. However, wire EDM process is one of the most popular types, which is employed in a number of industries. Wire EDM, which is also referred to as spark EDM, is an electro thermal production process where the wire is submersed in deionized water. An electric current is run through the wire, creating an electrical spark of intense heat up to 12000°C). The electrical spark cuts the material by removing the metal content through melting and vaporization. This content is flushed away from the work piece with high pressure flushing. This process has some characteristic properties, which makes it easy to machine precision components and complex parts. 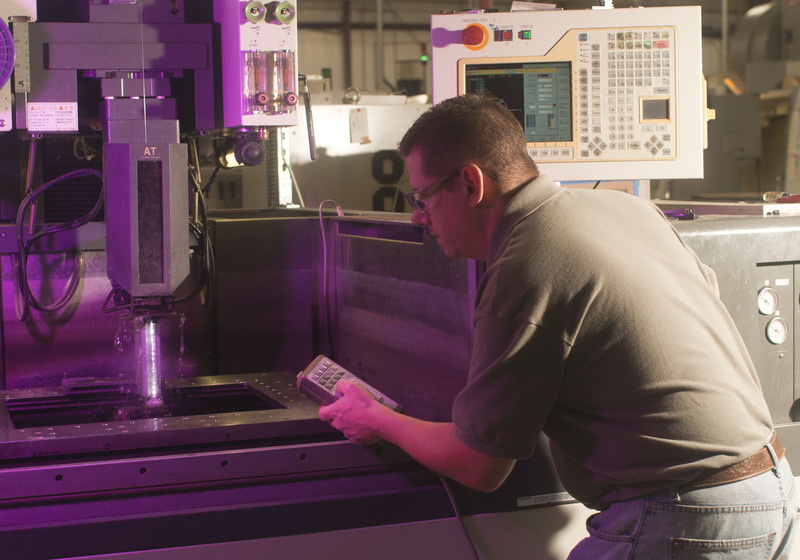 BDE Inc., is one of the leading providers of wire EDM services. We have 27 years’ experience in complex wire electrical discharge machining parts. Capabilities of Wire EDM Services Provided by BDE Inc. The following wire EDM service capabilities has allowed us serve clients effectively. 1. We can provide you with high-quality and precision-made products that are manufactured using 4 axis EDM cutting. 2. The cutting tolerances of the wire EDM cutting are up to +/- .0001. 3. We can deliver wire diameters of 0.006 ʺ, 0.008 ʺ, 0.010 ʺ, and 0.012 ʺ. 4. We provide wire EDM services for wide and large table travel measuring up to 13.7″ x 19.68″. 5. The cutting head “Z axis” can have a height of 11.8″. 6. The wire EDM services that we provide have the capability of delivering tapered cuts up to 45 degrees. This is based on the height of the work piece. 7. 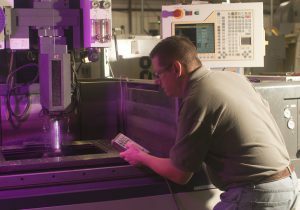 We use the most advanced machinery and tooling, which helps expedite the setups for production and prototype runs. 8. We make use of several CAM software, which helps us improve the adaptability of importing drawings, files, or parts. Conventional chip making machinery introduces heat into the materials in order to cut them. Without applying any heat, it becomes a tough task to cut or mold them. However, with wire EDM, you can cut metals without applying any heat to them. This process is best suited for good conductors of electricity. Some materials, which are compatible with this technique, include carbon steel, kovar, Inconel, bronze, carbon graphite, titanium, stainless steel, copper, tungsten, and Hastelloy. 1. Medical Device Manufacturing: As wire EDM machining makes it possible to cut or mold materials like steel without heating it, this method is an ideal choice of medical device manufacturers. With this method, the manufacturing of several life-saving instruments made from carbon steel becomes easier. 2. Tool, Die and Mold Making: With the help of EDM machining, it is possible to create very fine holes and profiles. Thus, electrical discharge machining is often used in the production of Molds, dies and Custom tools & Fixtures. 3. Military and Aerospace Applications: EDM is used widely in the military and aerospace industries to produce parts for important equipment. EDM are used to cut several aerospace parts. 4. Automotive Industry: In a competitive automotive industry, it is necessary to have short cycle times, and cutting costs. These are offered by EDM. Owing to its efficiency and accuracy, automotive manufacturers also turn to wire EDM. With a huge experience to back us, BDE Inc. can provide you the best-in-class services in wire electrical discharge machining. We have served a wide range of industries, including aerospace, food, medical, military, marine, electronics, semiconductors, and so on. Do you want to know more about our wire EDM services? Please get in touch with us today. You can give us a call on 503.648.7418 or you mail us your requirements at info@bdeinc.com.